I don’t have much to post today, but I wanted to share a new favorite thing I found yesterday. I went to the local Hallmark to pick up a wedding gift, and saw this by the register. 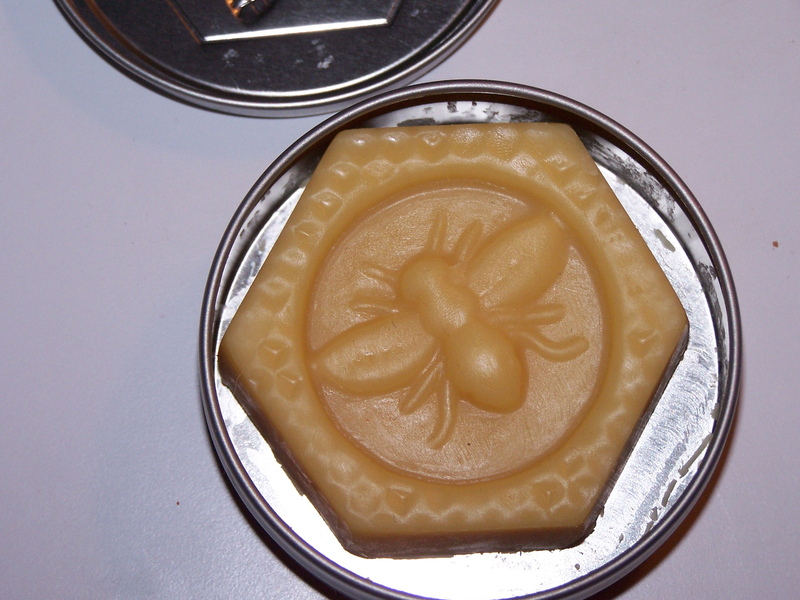 It’s Bee Bar Lotion. At first glance, I thought it was soap. But it’s a little lotion bar. Just perfect to run the ends of your fingers over when they feel dry from hand stitching. Or any other time. Smells good, too. I was going to give Corky (my longarm) her spa treatment today, but I decided to give my sewing hook a close look, since I’d experienced that thread breakage on the last quilt. I thought I might have it timed a bit too closely to the hook. While cleaning it thoroughly, I noticed that the tip of the hook felt quite rough. Hmmm…could this be a thread shredding burr? I gently polished it smooth, and then I went to tweak my timing. Not an activity I usually have trouble with, but today, I was all thumbs. I lost a set screw, finally found that. I had a terrible time trying to get the timing set today. And things got a lot worse before they got better. First, I had lots of skipping, so I knew the hook was too far from the needle. So I scootched it in some. Then, I kept getting worse breaks, even having sanded out the burr. I think, I hope, I finally got it back to good. I have good tension, anyway! Longarming…it can be such a love/hate relationship. Mostly love! But it does have it’s moments of misery. How does the hook get a burr? Anyone know? I fiddled with it til I got it stitching good again, and the thread (Rainbows) didn’t break after quite a lot of stitching, even at a fast speed. I won’t get to even touch my longarm again, til next weekend at the earliest. So I’ll have my fingers crossed til I can give her a good test. I sure thought I had her screwed up good, there for awhile. I didn’t even get around to giving her the spa treatment. Have a great week everyone! I prolly won’t be around much for a few days! I obviously need to visit Hallmark in your neck of the woods. You have such neat finds there!! I hope you did get it straightened out. I remember the first time I timed mine…. it took 3 days…. I think I remember asking the cabana boy to remove the princess so she wouldn’t learn new words too 😉 Have a great week!! Very interesting lotion bar! I like the bee design. I hope you get your longarm back in tip top shape. You probably feel like you are missing something while it’s at its spa treatment… but at least you will have a few days off to rejuvenate your creativity! I hope Corky is doing great when you get back to her. Did you know I have a nephew named Corky Don? No you didn’t but I do. 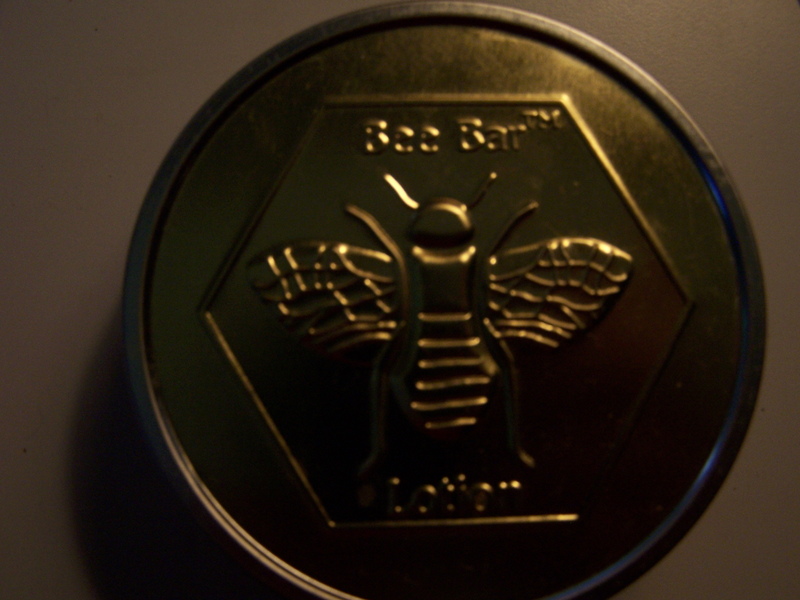 I love the bee lotion. Isn’t that the greatest lotion?? Also works great for dry elbows and heels and toes. Although I do put my socks on after applying it…I sometimes get carried away! I found my little bar last fall at a floral shop!